As farmers, Harrowden Turf Ltd know all about the shelf life of perishable products. And of all the things we grow, turf is by far the most perishable of all. It’s important that every roll of turf reaches its final destination in as good a condition as possible and years of experience have equipped us with lots of knowledge on how to do that. The trick lies in managing production, harvesting, transport logistics and customer expectations as efficiently as possible. Some things are beyond our control of course – the weather can be our friend or our enemy, depending on what it does. The volume traffic on UK roads is another bugbear and delivering palletised goods to sites with difficult access is another. Then there’s the customer’s expectations….a whole other subject. All of Harrowden’s turf production units are lucky enough to have long serving and experienced staff on site. They have a few little tricks up their sleeve to help turf to keep longer in the roll. In late spring and all through the summer, the number one challenge is overheating. As soon as turf has been harvested and rolled up, it begins to deteriorate. That’s the same for almost any living plant – cabbages, beetroot, strawberries – you name it. In turf the problem is exacerbated by soil microbes. Don’t get me wrong. We love our soil microbes. They’re what makes Harrowden’s turf super-green and lush and they help with rapid establishment. But when the soil is damp AND warm, they get super busy doing whatever it is they do and in doing so they generate carbon dioxide and heat. When turf is rolled up, the grass plants have very little access to the oxygen and the daylight that they need to survive and no air flow to cool them – they suffer. So, at Harrowden, we aim to prepare turf for the experience of being rolled up and transported by making sure it’s healthy and resilient before it’s harvested. Another trick – is to harvest at night. Before the heat of the sun has warmed the fields. Most of our turf is grown on distinctively dark coloured soil. That’s a good thing. Its kind to plants, warms up quickly in spring and cools down slowly in autumn so we get a longer growing season. It’s also relatively light so easier to handle and transport. BUT black soil does get hot on summer days. If we can harvest our turf while the soil is relatively cool, the rolls won’t go on to the pallet hot. All we have to do is keep them cool. Our aim in the summer is to have turf delivered as quickly as possible, before it starts to heat up. Whenever and wherever possible harvesting begins from 2am. The stacked pallets are immediately loaded on to lorries for delivery later that day. Where lorries can’t be loaded straight away, the palletised turf is taken to a large airy shed and kept out of the sun until vehicles arrive to take it away. Our newest lorries have been designed for maximum air flow. Where we have to have help from couriers, pallets of turf are trunked between depots and unloaded at least once during their journey so that air can circulate freely around them. Professional landscapers know exactly how to handle turf. 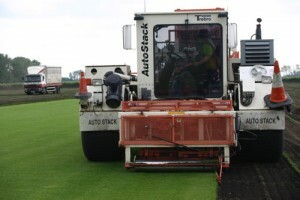 They have the ground prepared before the turf arrives and can work quickly to get it installed as soon as possible. The customers that struggle most with turf overheating are garden centres, landscape suppliers and re-sellers. 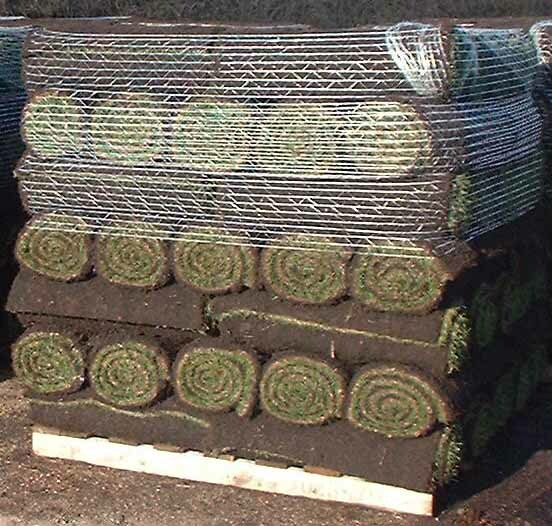 Harrowden Turf does offer lots of advice on keeping turf cool, extending the shelf life and minimising wastage. This same advice is frequently given out to customers who are inexperienced turfers too. Stack turf in a shady place but NEVER cover it and DON’T water turf while it’s rolled up. Water newly laid turf as soon as it’s on the ground. If you have a large area to cover, lay one palletful of turf and start watering it whilst the next palletful is being installed. You might get wet knees but that’s a tiny problem compared to having burnt out turves. Got a question about turf shelf life? 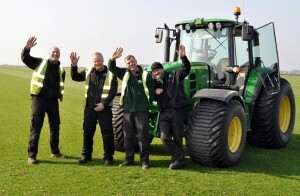 Harrowden turf staff are more than happy to help. Simply phone or email your nearest sales office and someone will happily answer any questions you may have.